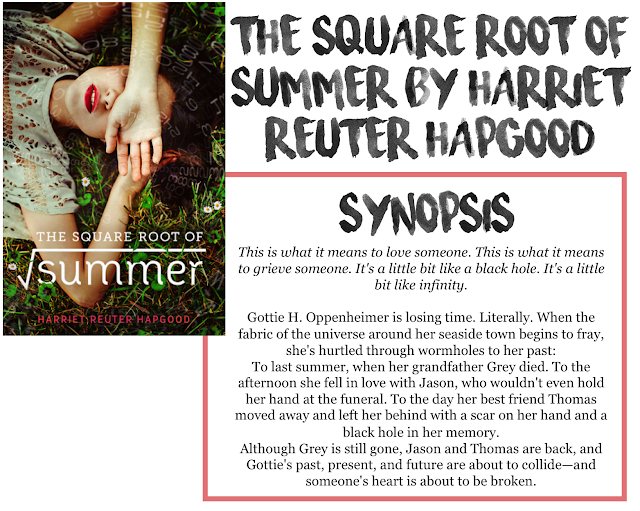 I am so excited to be working with the amazing people over at Raincoast Books and be a part of the blog tour for what might be one of my favourite books of the year, The Square Root of Summer by Harriet Reuter Hapgood. Each blogger got to ask one question to Harriet, and because I am randomly obsessed with names, and there are some really interesting ones in the book, I asked her about them! How did you come up with the names of the characters in the book? Slowly! Few of the names from the first draft made it through – they’re just placeholders while I explore who the characters are, and they really come together as people for me once I find the right name. (Or borrow a name from a friend or relative.) Gottie started out as Mallory Reynolds – a Firefly reference – then Mallory Kreutz once I decided she’d be half-German like my mum. Once I realized I was writing about family, she became Margot Kreutz (a shoutout to my auntie) and I figured an older brother like Ned would conjure a weird nickname like Gottie. Thomas’s surname was actually Oppenheimer til my agent pointed out that was two German families in one English book, so I switched his surname to Gottie’s and Gottie H. Oppenheimer was born (H for Hella, my great-aunt). Ned is short for Edzard, another family name. Ms Adewunmi is for a Twitter friend; Megumi is also a friend. A lot of it is just pure thievery – I know a lot of people with great names! In addition to the Q&A, I had the opportunity to read an eGalley of this book for an honest review, thanks so much Raincoast Books! As always, all opinions are my own. Gah! I loved this book. LOVED. IT. I don't know why, but it felt like home. No, I'm not insane, I just don't know how to describe it. This was just a genuinely fantastic book. If you are scared of this book because there's math and science and physics or whatever, don't be. Does it get a little science-y? Yes. Did some of it go a bit over my head? Yes. Does it take away from the book? No, definitely not. Even though there's wormholes and blackholes and equations and whatever, there are enough other things going on in the book to break it up so you don't feel like you are in a science class at school. Ok, let's start with the characters! 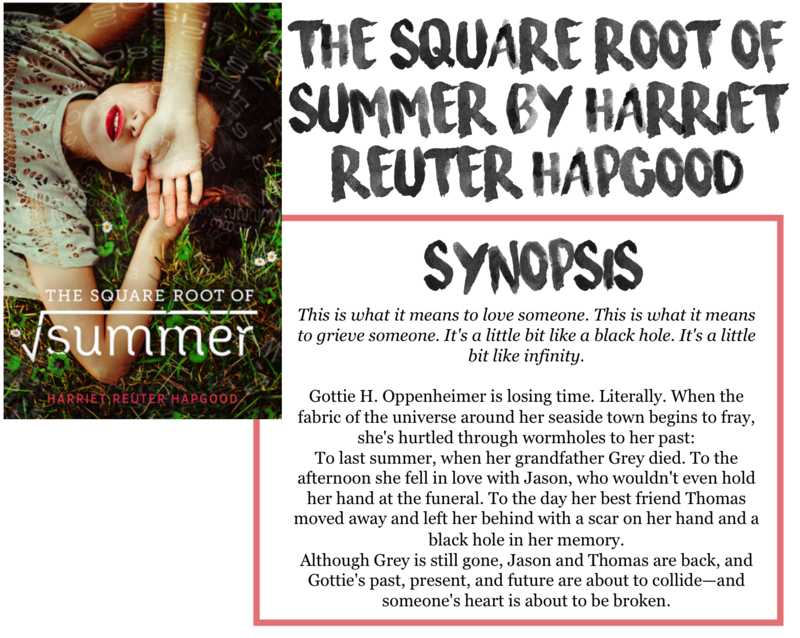 First, the main character, Margot "Gottie" H. Oppenheimer. I just love her name. Gottie is such an incredible character. She is smart, but also fairly in tune with her ability to socialize and interact with other people. She's not your typical "nerd" character. In fact, I think what I love most about this book is that it is so unique. Maybe it's just because I don't really read a ton of books that deal with time travel, but this book was so different from what I usually read. Gottie does have her flaws though. She lies fairly compulsively and she doesn't always see how her actions will affect other people. But it's those flaws that make her so real. None of these characters are perfect, and they shouldn't be. There are a bunch of other supporting characters, Gottie's brother Ned, their father who just goes by Papa, a group of friends, including Gottie's best friend, Sof and Ned's bandmates Jason and Niall. One other character, Thomas, comes into the story fairly early on, and pops up a bit in Gottie's flashbacks/time travel, because he was their old neighbour before he and his parents moved to Canada (<-- YEAH represent! Also, sidenote, the Canadian stereotypes in this story were GREAT). Anyways, I really loved Thomas's character. He was sweet and very boy-next-door-ish. After his parents get divorced, his mom decides to move back to England and Thomas spends the summer at Gottie and Ned's house. This story is set in the English countryside, and you really get that small town feel. Grey, Gottie's grandfather owned a bookstore in town and after he died, Papa took it over. Between scenes there, a cafe that closes whenever it wants, Gottie's tree house room and the small high school, the small town charm is real. Time travel is a major part of this book, like I mentioned, but I really loved how it was done. For people like me who know next to nothing about it, the author made it really easy to follow. Still, at the same time, if that sort of thing interests you, you will get the scientific descriptions, and there's even some diagrams to help explain! (I really nerded out over those diagrams!). Usually when Gottie was describing something science-y to someone, she would tell them in science words and then they would be all, "Umm, English please?" and she would describe things in a way that the average person would understand. There is also some romance in this book, and while, like the time travel, it was an important component of the story, it was well done and not forced. I really loved how even though this book had other elements, the story really is about Gottie and the reasoning behind her ability to time travel. Once you get to the end, and see what happened to cause everything, it really is heartbreaking. Even though the book quite clinically describes what happens as time travel, and a perfectly normal situation, one could even suggest that the events are a result of a mental illness and hallucinations, which makes me love this story even more! I think the important thing to remember here is that yes there is romance and time travel, but this is a story about grief. About old wounds of losing her mother at birth, her best friend five years ago, and now losing her beloved second father, her grandfather. Say what you will about how the story is told, but this is the brass tacks, bare bones reality, and I think it is so important to remember what this book is about on a base level. Overall, I highly, highly recommend this book. Whether you are a science lover or not, whether you are a homeless romantic or not, READ IT! 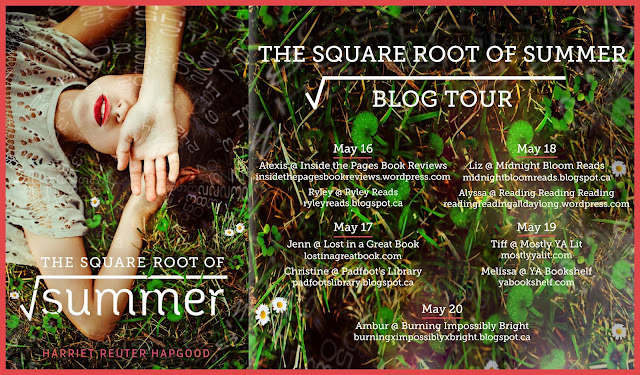 Thanks again to Harriet Reuter Hapgood and Raincoast Books for the opportunity to participate in this blog tour!